Expertly sourced & crafted. 1 of your 5 a day. A uniquely crafted fruit blend. Bold, tangy & refreshing. Contains only naturally occurring sugars. Suitable for vegans and vegetarians. 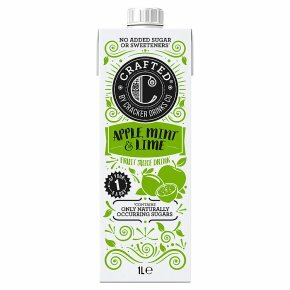 Blended to perfection Delicious and bold, the sweetness of apple is followed by the fresh fragrance of the mint which is balanced perfectly with the tanginess from the lime. This wonderfully refreshing drink has a smooth, light finish.